April 29, 2015 – Forty nine percent of Americans say they are only somewhat or not at all knowledgeable about food allergies, according to a new national survey of 1,031 American adults. Many people also have misconceptions about food allergies, including believing there is a little or no difference between food allergies and food intolerances, and that someone with a food allergy can eat small amounts of a food without having a reaction. It’s in this environment that the Food Allergy & Anaphylaxis Connection Team (FAACT) and American College of Asthma, Allergy & Immunology (ACAAI) are launching a public service campaign to raise awareness of accurate food allergy diagnosis and effective management. Through public service advertising and traditional and social media, Americans will be encouraged to visit livingwithfoodallergies.org ─ and then take their questions and concerns to a board-certified allergist. 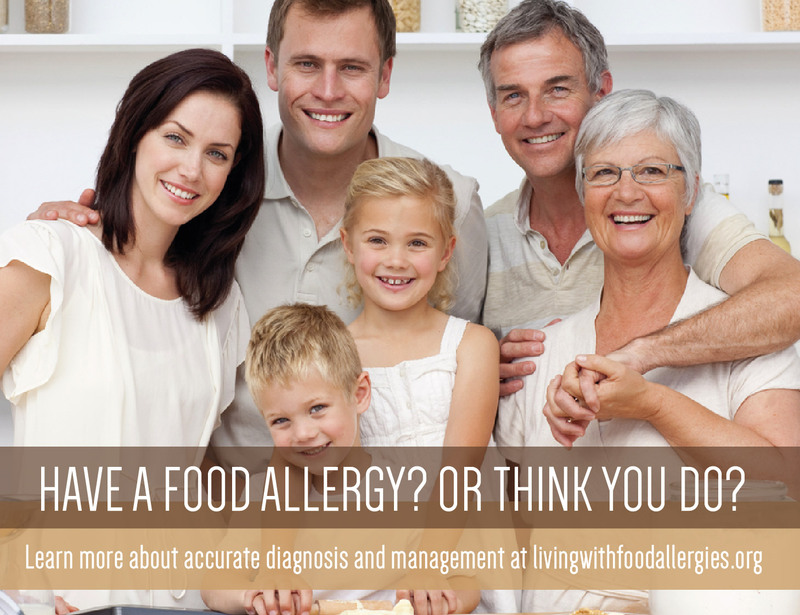 Visitors to livingwithfoodallergies.org will be able to quickly access science-based information from ACAAI and other trusted sources, and find a board-certified allergist in their area. The site is seamlessly integrated with FAACT’s own website, which provides links to local support groups, resources for developing food allergy and anaphylaxis management plans and other resources valuable to anyone who has a food allergy or thinks they do. One in four reported they would search the internet or visit a health-related website first for food allergy information. The campaign is funded in part through a grant from the National Peanut Board. Since its founding in 2001, the board – which represents America’s 7,500 peanut farming families – has dedicated more than $12 million to independent food allergy research, education and outreach. For more information on accurate diagnosis for a food allergy or steps on how to create a safer environment for living with a food allergy visit livingwithfoodallergies.org. FAACT\\\'s mission is to educate, advocate, and raise awareness for all individuals and families affected by food allergies and life-threatening anaphylaxis. FAACT is also your voice for food allergy awareness, from keeping children safe at school to dealing with workplace issues or simply taking the family out for a bite to eat. Managing a food allergy on a daily basis involves constant vigilance. FAACT is here to support you in managing your food allergies – today, tomorrow, and into the future. For more information, please visit us at FoodAllergyAwareness.org or call 513.342.1293, and follow us on Facebook, Twitter, Pinterest, Instagram, LinkedIn, and YouTube. The ACAAI is a professional medical organization of more than 6,000 allergists-immunologists and allied health professionals, headquartered in Arlington Heights, Ill. The College fosters a culture of collaboration and congeniality in which its members work together and with others toward the common goals of patient care, education, advocacy and research. ACAAI allergists are board-certified physicians trained to diagnose allergies and asthma, administer immunotherapy, and provide patients with the best treatment outcomes. For more information and to find relief, visit AllergyandAsthmaRelief.org. Join us on Facebook,Pinterest and Twitter. The National Peanut Board represents America’s more than 7,000 peanut farmers and their families. Through research and marketing initiatives, the Board is finding new ways to enhance production and increase consumer demand by promoting the great taste, nutrition and culinary versatility of USA-grown peanuts. For more information, visit NationalPeanutBoard.org or PeanutAllergyFacts.org. The food allergy research was conducted via a national online survey of 1,031 American adults ages 18 or older on March 2, 2015 through Toluna, a leading international market research firm. The results are weighted and balanced to conform to current US Census projections for gender, age, region of residence, and ethnic and racial heritage. The data have a ±3.4% to 3.8% Margin of Error at 95% confidence at the “all respondent” level.